I know it’s a little late in the game, but… my word for the year is TRUST. I chose this word about a little over a month ago when my life and my priorities looked totally different than they do at this moment. At the time, my life was not going as I had planned. However, the last few weeks even my “new normal” has been flipped, ripped, and scattered in ways I never would have imagined. With very few remnants of what I deemed as routine or normal 4 months ago. That’s life though. Circumstances change, feelings change, trials change; but God remains the same – faithful, true, trustworthy. 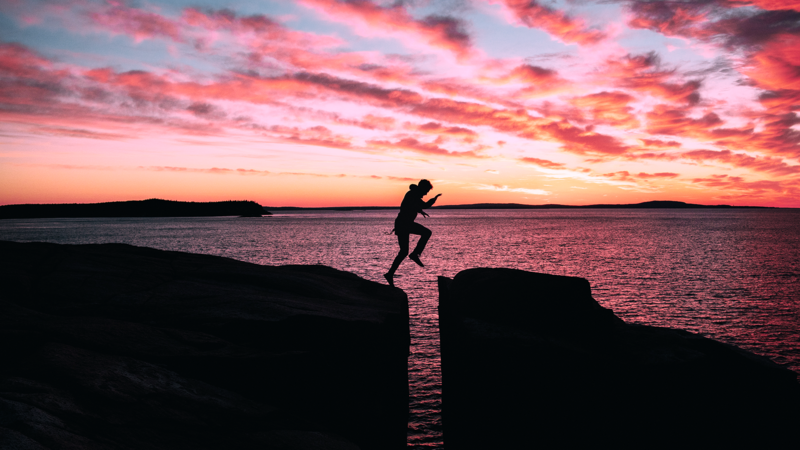 In hindsight, it is crystal clear why the Holy Spirit prompted me to settle on TRUST. I had a list of several words I was considering and praying about. However, as soon as I wrote down the word “TRUST” the Holy Spirit poured revelation into my spirit. I knew all the other words – patience, perseverance, joy, grace, balance, pressing, strength – relied on trust. Trusting God enough to “allow” Him to be in control. Believing that God is good. Standing on the promise that He works all things for good. For my good (Romans 8:28). Even when I cannot fathom, in this world or the next, how certain circumstances will benefit me or the kingdom. "Trusting God does not mean believing He will do what you want, but rather believing He will do everything He knows is good." Trust does not come easy for me. Like most people, I have had my share letdowns and unmet expectations. I’ve been used, lied to, manipulated, abandoned, and wounded. Unfortunately, all too often, I anticipate the same from God. I forget Who God is. I expect the same flaws and frailties I have experienced at the hands of other people from God. But the trustworthiness of God and that of man is oh so different. God is all knowing, all loving perfection in every aspect. Man is fallible and selfish. I am fallible and selfish. But God is not. God is not a man that He should lie (Numbers 23:19), and He will never leave us (Deuteronomy 31:8). God will provide peace and shelter from the storms of life if we will seek Him. If we will trust Him. Now, I trusted God with some big things. My trust in Him for finances was solidified several years back. I know He will provide, whatever the need, according to His will. And I trust in His healing “most days” as I am a walking recipient of His faithfulness. But I wasn’t trusting Him in the small. With the headaches, the colds, and the fatigue. I did not have my eyes fixed on Him. My heart in tune with the Holy Spirit. I wasn’t seeking Him with my whole heart. Not consulting Him for every choice. I would will my way through. Push my own agenda and desires. And then expect Him to bless it. To bless me. But what happens when you finally realize you have absolutely no control over your circumstances. When you are literally so exhausted and overwhelmed you feel like you cannot make one more decision. Well, you either cave in, give up, allow fear and anxiety to take over…or you TRUST God. It’s easy to trust God when everything is going good, when we are on the mountain top. But it is different to trust Him when things aren’t so great. I’ve learned it also is one thing to trust Him when you have an answer, even if it’s not an answer you like. However, it’s a whole different ball game learning to trust Him when you have no answers. Now I’m not talking about answers to the “why” questions. We will never have all the answers to the why. At least not on this side of eternity. As God’s ways are higher than ours (Isaiah 55:8-9). I am talking of the what, when, who, where, how questions. The diagnosis that is eluding countless physicians in numerous specialties across 3 states. A progression of events that can’t seem to be halted or reversed. Having no prognosis because no one can give you a diagnosis. The seemingly never-ending waves of disappointment crashing into your little boat. The boat that could withstand the small storms but is now flooded with uncertainty, and you can’t bail the water fast enough to keep it from sinking. outcome or the cost. Believing He will not let me fall. Believing that the end result will ultimately be for good. And that God is with me in the fire, in the battle, and will carry me through to victory. 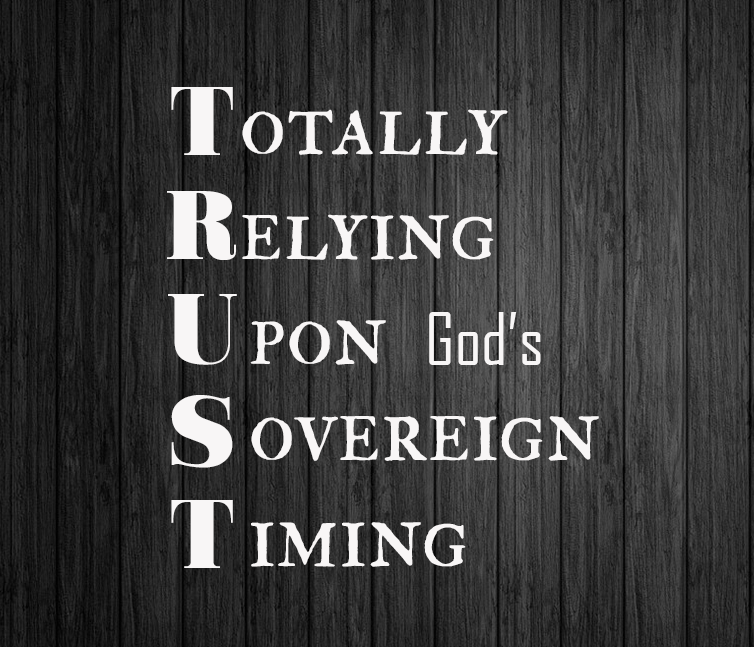 TRUST is Totally Relying Upon (God’s) Sovereign Timing. Not my timing or my plan. But His timing and His plan. Believing that God is in control and His will is ultimately the best possible outcome. reactions…) Trust means surrender. A willingness to be molded and reshaped. But trust doesn’t come without sacrifice. Without some pain. Without laying down my will for His in every area of my life. But He knows me. He knows my tendencies and my weakness. My propensity for stubbornness and for “pushing the envelope”. Yes, and even my desire to be in control. I have had to trust Him for wisdom and discernment. For the strength to physically take the next step. The perseverance to get out of the bed and drive to the hospital again today. The guidance to make the next decision. Trust Him when there was no answer or end in sight. We had to trust God to meet needs ranging from the seemingly minuscule to the seemingly impossible. From health insurance issues to home repairs. Even for the basic need of food (not financially but physically) because I was utterly overwhelmed. God doesn’t require me to know all the answers or to figure any of this out. He has it all covered in advance! However, He does ask two things of us – to worship Him in all circumstances and to trust Him at all times. God asks that we love Him with all our heart – worship Him. And that we believe in Jesus Christ – believe He is the Son of God sent to save us from our sins through the power of His life, death, and resurrection. These two things require TRUST. We have to trust that God is who He says He is. And trust His Word. Trust our lives and our futures to God. Trust that Jesus is alive and waiting for us in heaven. So if you are suffering in a manner that pleases God, keep on doing what is right, and trust your lives to the God who created you, for he will never fail you. 1 Peter 4:19 (NLT). God does not promise us life will be easy. No, in fact, He prepares us throughout His Word that there will be trials. There will be suffering. But God does give us the promise that He will be with us through it all. God’s plan is better than mine. He knows the end from the beginning. He will bring about ALL that He has promised in His timing. I need to trust Him in the darkness, in the illness, in the tired and weariness. In the valley and on the mountaintop. I must trust with my whole heart that God is good. Trust that He knows every tear, every trial, every frustration, temptation, and doubt. Trust Him in all things, at all times. I have to trust that there is a plan and purpose for this season, for these trials. I must believe that although the enemy is attacking, God will ultimately use it for my good. Trust Him to carry me through the battle to victory on the other side. No matter what it looks or feels like right now. 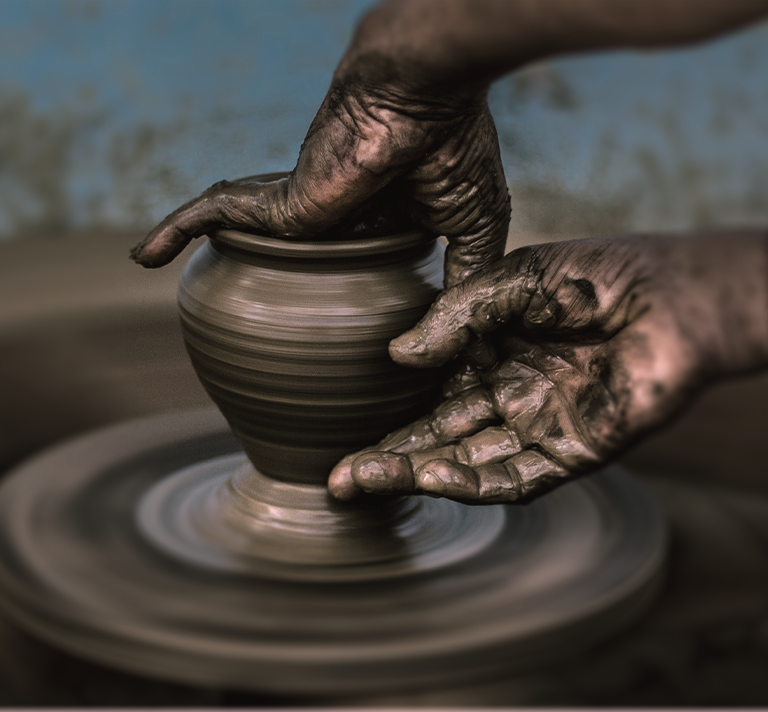 I have spent a whole lot of time on the Potter’s wheel (Isaiah 64:8) over the last two month. I have been stretched, molded, sculpted, and reshaped. Then after a way to brief (in my opinion) “curing” time, I was put back on His wheel for the whole process to start over again. And the cycle continues. This is our life though, as believers in this fallen world. We may get dented or misshapen, twisted or blemished, maybe even chipped and cracked by the tests and trials. But God is there to pick up the pieces and restore us. He only asks that we be pliable. He will not destroy us. God may bend and even break us, but it is only to reshape us. We must trust that the process is making us into the vessel He has called us to be. trivial really, in the grand scheme of my life. Much less the kingdom. Do the wounds hurt? Yes. Do they feel like gaping wounds that may never, ever be knit back together? At times, yes. But not true. God can mend all wounds. Heal all heartbreak and rectify every situation. He is the ultimate healer. He gives and takes away. God is molding me with every trial. With every fire. With every hard knock. He is with me through it all. He will guide me through it all if I will walk with Him. Not ahead or even beside. But if I will follow and let Him lead. If I will TRUST Him. I can endure ALL things and be stronger because of them. Do you have trouble trusting God with your life and your struggles? In the big and the small? As I said before, I certainly do at times. When my trust has faltered over the last two months (and that has been more often than I would like to admit), first, I do a heart and mind check. Am I believing God and His promises? Or am I listening to my feelings or the lies of the enemy? The answer is always the latter. My plan of action: prayer, the Word, and worship. Even the simple utterance of “God, please help me trust You right now. Remind me that Your promises are ‘Yes’ and ‘Amen’. In Jesus’ name, Amen” has done wonders to shift my attitude in a matter of seconds. The Word contains so many Truths on trusting God and the promises of His faithfulness. A great resource when searching for scriptures on a specific topic (trusting God) or struggle (worry or fear) is Open Bible. I also created a “TRUST” playlist. Music speaks to my soul and lifts my spirit almost immediately every time. These two songs specifically have helped me through some rough days. When I need the reminder that all these trials will be for my good and His glory and He is with me through it all. What do you need to trust God with today? How can you surrender to Him and trust His plan? Do you have a “go to” scripture when your trust in God starts to waver? I’d love to hear from you. Please comment below or email me at angela@authenticallyaltered.com. If you have any questions about trusting God with your life, your struggles, and your future or accepting Jesus as your Lord and Savior, please email me at angela@authenticallyaltered.com.